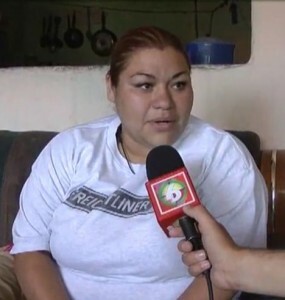 Last Thursday it was reported that Mexican mom Karla Vanessa Perez of the northeastern state of Coahuila, was pregnant with nonuplets(six girls and three boys). She had allegedly underwent fertility treatments that resulted in a 9 baby pregnancy. Believed to be due on May 20, Karla spoke to reporters from her home saying that it was too early to name the babies as she wanted to make sure that they all arrived safely. At that time I watched the footage thinking she wasn’t showing like a mom who was pregnant with 9 babies should be. Do we remember how BIG Nadya Suleman got while pregnant with her octuplets? Massive! Health officials now claim that she’s not pregnant (with even one baby), just obese and that she can’t possibly be expecting as she’s had her fallopian tubes tied. “Humanly and scientifically a pregnancy of nine would only be possible through IVF. But never through natural methods, and even less so when a woman who has undergone a salpingectomy (the surgical removal of the Fallopian tubes she had following the birth of her youngest child). ‘She will become terribly depressed, which could lead to her hurting herself and, at a given time, could try to commit suicide’. Officials also say that the lying mom doesn’t have triplets but three older children with car mechanic husband Juan Bernardo Garcia Morales, aged four, 12 and 15. This isn’t the first time we have seen a mom lie that she is expecting an extraordinary set of babies. In 2008 Nancy Cantu and her boyfriend Juan Solis were arrested after it was revealed that they had lied about expecting quintuplets and accepted donations from well wishers. This was just a day after Sarah Everson was sentenced to four years in prison after she pretended to give birth to sextuplets in order to get money from generous neighbors. Jessica Simpson and Eric Johnson Welcome A Baby Girl!